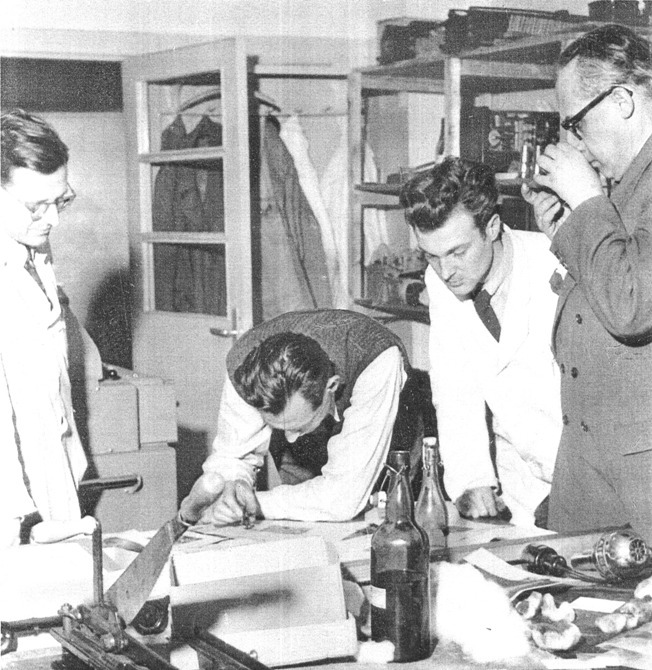 Dr. Rudolf Hell (1901-2002) was one of the most important German inventors of all time. E.g., with Prof. Dieckmann he invented the Photoelectric Image Scanning Tube (TV camera tube, patented in 1925); he invented the electronically controlled "Klischograph" half-tone photo-engraver in 1951 and revolutionized printed press technology, the first practical fax machine in 1956, a color scanner in 1963, a computerized CRT type-setter in 1965 (Datensichtgerät DS 2038, not unlike the IBM PC of the early 1980s! ), and many technical processes. The renowned calligrapher and font designer Prof. Hermann Zapf (Hell Digiset fonts, standard PC fonts like Zapf-Dingbats, Palatino, etc.) rightfully referred to him as "the Edison of the Graphics Industry" and "the father of digital word processing". Hell's biographers Onnasch and Fuchs call him "Engineer of the Century". Ref. 7. He was indeed a "pioneer of teleprinting, television, fax, scanner, and printing technology" (say I). It went into service with press agencies and news media in 1934. The Hellschreiber is a Typenbildfernschreiber, basically a "character-image tele-writer" or "print-telegraph". Copies of Dr. Hell's patents related to the Hellschreiber are available below. "Ich habe nie etwas gemacht, nur um Geld zu verdienen. Es ging mir um den Fortschritt und die praktische Anwendung"
"I‘ve never done anything just to earn money. For me, the important things were progress and practical applications." Some non-German publications and websites persistently state that the word "Hellschreiber" actually means something like "bright writer", "brightly writer", or worse, "bright writing". It does not! This nonsense is brought on by misuse of dictionaries and online translation tools. Remember: "a fool with a tool is still a fool". If anything, the Hellschreiber is the opposite of a "bright writer": "Der Hellschreiber ist ein Dunkelschreiber! ", as it prints dark on a light background. "Hellschreiber" is also not a pun on Rudolf ’s last name: through the mid-1900s, it was simply customary to attach the name of the inventor to the name of the product or system (at least in Germany). The Hell family was fortunate enough not to be living in modern-day Australia, where their surname could have caused them problems [ref. 40]. For those readers not conversant in the German language, I definitely recommend reading the one-page essay "The awful German language" by Mark Twain [ref. 55], one of my all-time favorite authors. I admire the ability of the German language to perfectly reduce an entire concept or sentence into a single word, that requires no further explanation. Nice examples of this are Wechselstromtelegraphiekurzwellenzusatz, Wehrmachtsfunkfernschreibschlüsselnetz, Streifenvorschubgeschwindigkeitsregelung, Schriftzeichenübertragungsgeschwindigkeitsregelung, and Wehrmachtsquarzkristallsparschaltungsnachfolger. In 1926 and 1927, Hell published a number of amateur radio publications for the do-it-yourself construction of antennas and equipment, including a receiver/printer for text transmissions [e.g., ref. 62, 77, 78]. "Zur Übertragung wird das Bild im Bildsender in einzelne Bildelemente zerlegt, die in Stromimpulse verwandelt werden. Der Empfänger schreibt entsprechend den ankommenden Stromimpulsen selbsttätig Punkte und Striche in richtiger Reihenfolge auf das Empfangsblatt." "For transmission, the sender decomposes the image into individual pixels that are converted into current pulses. The receiver mechanically prints the arriving pulses as a an equivalent sequence of dots and line segments." The Hellschreiber is a simple and robust system that was developed specifically to provide readable, error-free communication, even on low-quality radio and land-line telephone links and in mobile applications. This made it particularly suitable for press agencies, diplomatic and military communications (incl. in combination with crypto machines), communication over high-voltage power-lines [ref. 29, 53], police communication [ref. section 10a in ref. 1 (Medium Wave network), 73], and… amateur radio! It is based on raster-scan transmission of text characters , and printing the received signals as-is (no decoding required) with a helical scan mechanism. In other words: a simple form of fax, or remote dot-matrix printer. See more details on my "How it works" and "Photos" pages. Wireless services of news agencies such as the Deutsches Nachrichtenbüro (DNB), Deutsche Presse-Agentur (DPA), the Allgemeiner Deutscher Nachrichtendienst (AND), and Reuters [ref. 47], transmitted their messages in Hell-format. See the Presse-Hell pages. Reuters started its to the European continent in 1934. Broadcasting was primarily done on long-wave frequencies, to get continental coverage. Ref. 6. In the post-WWII years, agencies such as the Deutsche Allgemeine Nachrichten Agentur (DANA), Deutsche Nachrichtenagentur (DENA), the Deutsche Presse Dienst (DPD), Deutscher Sportverlag (DSV), and Telegrafnoie Agentstvo Sovetskogo Soiuza, (TASS, Telegraph Agency of the Soviet Union) also used the Hell format. TASS continued Hellschreiber broadcast at least through the mid-1950s. The Wehrmacht is the combined army ("Heer"), navy ("Kriegsmarine"), and air force ("Luftwaffe") in Germany from 1935-1945. The Hell-system was used for military field operations. Hence, the Wehrmacht Hellschreibers are also referred to as Feldfernschreibers or Feld-Hellschreiber. They entered into service ca. 1935 - in time for the start of the war [see p. 50 of ref. 48]. Feld-Hell machines were also used by the armed forces of other countries (e.g., until ca. 1960 in Sweden). There are indications that Feld-Hell machines ("teletipo de campaña") were used by the Spanish armed forces, in particular the national army, during various conflicts: the Spanish Civil War 1936-39, World War II (a Spanish legion in the USSR), and the Ifni Wars (Spanish West Sahara and around the Moroccan coastal city of Sidi Ifni) 1956-58. The Italian army also used Feld-Hell machines ("telescrittore campale", "telescrivente da campo"), see the Italian Hell-telegram here. The Finnish armed forces - with German supplies - used Feld-Hellschreiber in the Karelia region during the 1941-1944 "Continuation War" against Russia. The Hungarian army also used Feld-Hell machines, with legends in Hungarian. The Luftwaffe also used Hellschreiber technology for aerial navigation, as part of the "Bernhard" system. The ground-station transmitted the momentary azimuth of its rotating narrow-beam antenna in Hell format on VHF (30-33.3 MHz); ref. 3. Its airborne counterpart is a small Hell-printer, the FuG 120 "Bernhardine" ("UKW-Richtstrahl-Drehfunkfeuer Empfänger" or "Receiver for rotational directional VHF beam beacon". It was installed in various aircraft types, esp. night fighter versions, such as the Messerschmitt Me262 (one of my all time favorite aircraft), Junkers Ju 88G, Arado Ar234 [ref. 4], and Dornier Do-335. The Kriegsmarine used Hellschreiber as part of the on-board intercom system [ref. 75], as well as ship-ship and ship-shore communication. 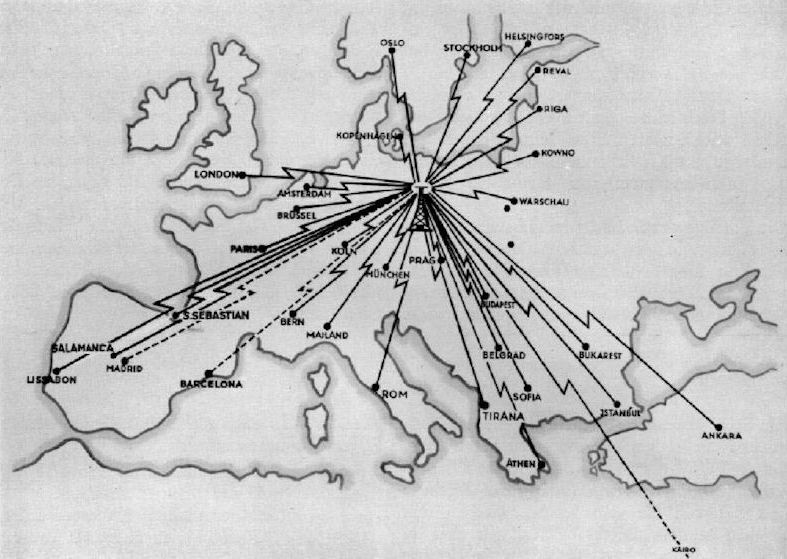 This included broadcasts from Germany to (submerged) submarines worldwide, with the 1 megawatt "Goliath" VLF transmitter near Berlin. The German military has operated the Hellschreiber in combination with the famous Enigma encryption system [ref. 31, 32, 52], e.g., for message exchanges between headquarters in European capitals (Athens/Greece-Vienna/Austria, ref. 3). 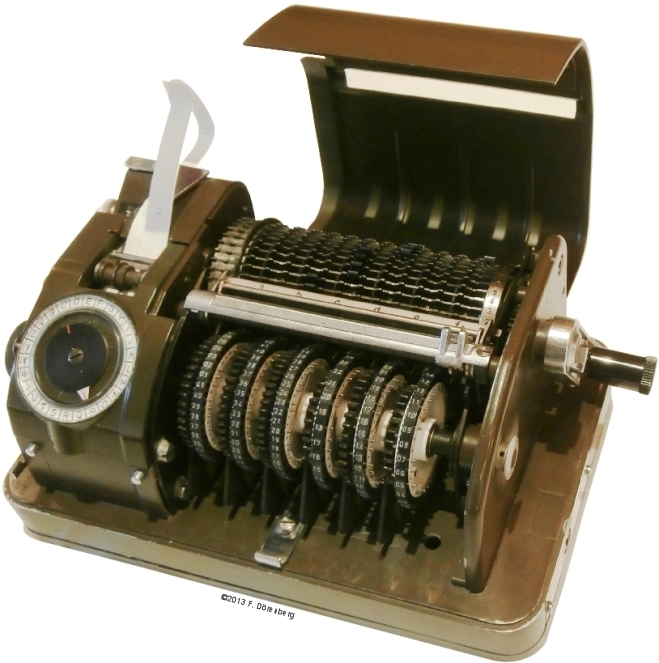 In 1944 the Hell Co. developed the "Hell-Geheimschreiber" encryption machine. It used 235 possible codes for each 7x5 dot character, using a one-time-pad encryption algorithm with a period of 1014 [ref. 5]. Apparently only half dozen or so of these machines were ever made. They were used in U-Boot, and on Kriegsmarine ships in the Mediterranean in 1945. The Hell Co. resumed the design and manufacture of crypto systems in the 1950s. During the war, the Reichsbahn (German national railways) used "Presse Hell" Hellschreiber broadcasts over short-wave radio, to disseminate train schedules, etc. Its messages were intercepted by the BBC Monitoring Service (BBCMS) [ref. 69]. After the war, the Deutsche Bahn used well over a thousand Hellschreiber machines [ref. 70]. Commercial use of Hell-systems continued well into the 1980s. Rudolf Hell was born on 19 December 1901 at the local freight railway station of Eggmühl (Lower Bavaria, 15 km south of Regensburg, 90 km northeast of Munich) where his father, Karl Hell, was station master for the Königlich-Bayrische Eisenbahngesellschaft (Royal Bavarian Railway Co.). It is here were Rudolf was exposed to telegraphy at an early age. His mother, Lidwina, was the daughter of a farmer and beer brewer. 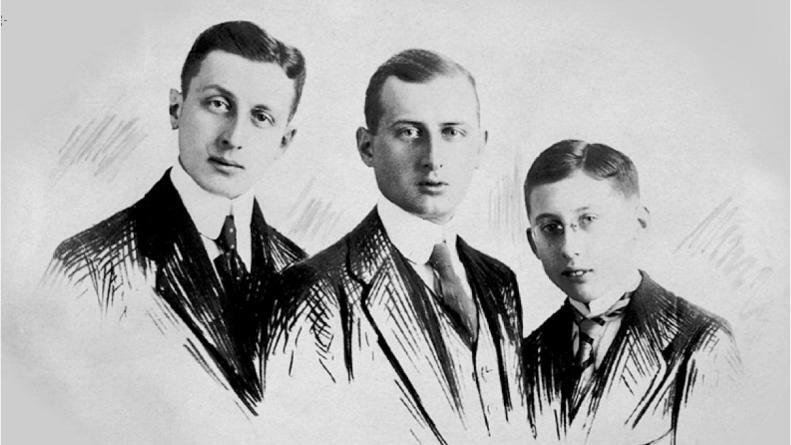 Rudolf had two older brothers, Karl and Max. The area was a battlefield in 1809, when Napoleon's army defeated the Austrian army under Archduke Karl. At the age of six, his father was transferred some 160 km (100 mi) north to the freight station in the town of Eger, then in the Austro-Hungarian empire - now a border-town in the Czech Republic and named "Cheb" since 1945. This is where he attended elementary school for four years. He was a bit of an outsider and didn't hang out with the kids in the street. Apparently he had a pale complexion. Attempts were made to strengthen him, and bring color to his cheeks with red wine. 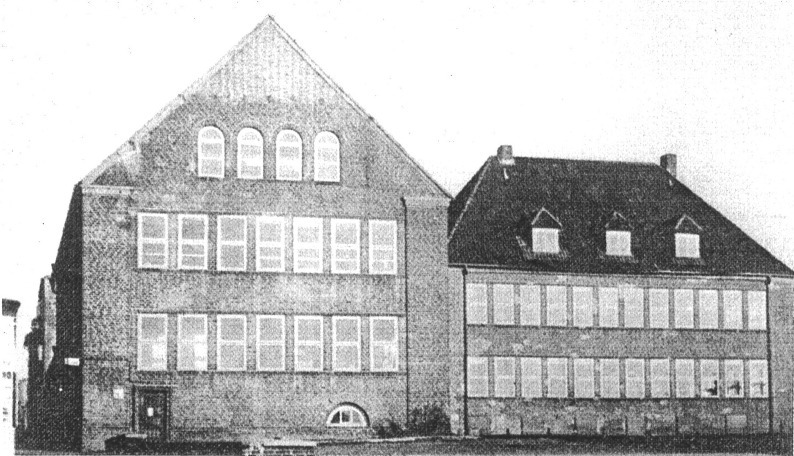 After finishing elementary school, he went to the Rudolphinium Oberrealschule (a form of secondary school). It was not named after young Rudolf, but in honor of King Rudolph I of Habsburg. Rudolf graduated in 1919. He was good at physics and math, mediocre at languages, and was poor at subjects that didn't interest him. At the age of 18, he went to the Technische Hochschule München (Technical University in Munich) where he obtained his "Diplom-Ingenieur - Elektrotechnik" (Dipl.-Ing.) degree in 1923 (Master's Degree in Electrical Engineering). This is where he met Prof. Max Dieckmann (ref. 43), who lectured on wireless telegraphy and was forced to rename his lecture "wireless television" to something less provocative. Dieckmann was already involved with scanning of text characters, converting them into electrical pulses and displaying them on a cathode ray tube (CRT) [ref. 44A/B/C]. The CRT was invented in 1895 by Nobel Prize laureate Karl Ferdinand Braun. To this day, it is still referred to as "Braunsche Röhre" ("Braunian Tube") in German speaking countries and in Japan. Dieckman was Braun's assistant 1905-1906. In 1925, Hell filed his first patent (with Dieckmann): an image decomposition tube ("Bildzerlegerröhre") - the video camera tube! In 1927 Hell obtained his doctorate degree with a dissertation on "a direct-indicating radio direction finder for aviation" [ref. 79], which became the basis for automatic guidance and auto-pilots of aircraft. The invention was licensed to Telefunken and to a US company for a tidy sum: 20,000 Reichsmark (the currency in Germany from 1924-1948); ref. 65. This is estimated (by me) to be the equivalent of roughly three quarters of a million US dollars (2008). In the late 1920, Hell considered the TV technology to be in an impasse, and switched over to facsimile. In May of 1929 (at the age of 28), he and his wife Martha moved to Berlin-Babelsberg, and had a furnished room in the house of an employee of the Auto-Union (a combination of the automobile and motorcycle companies DKW, Horch, Audi ("Horch" in Latin), and Wanderer). 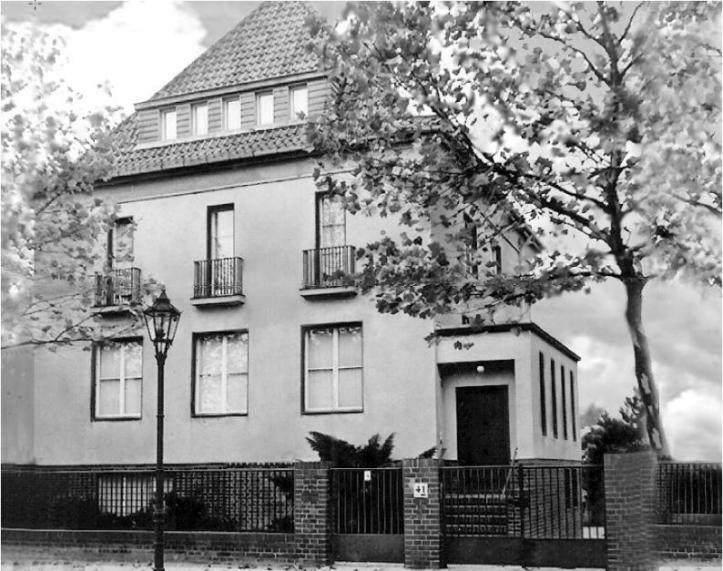 Shortly thereafter, he bought a house at Ihnestraße 41 in Berlin-Dahlem (it still exists today, see here). This is where the Dr.-Ing. Rudolf Hell Company was founded. The machine shop was in the basement, the design office and lab on the ground floor, the office in the hallway, and private quarters upstairs. Hell worked here with about a dozen employees. His patent entitled "Device for the electrical transmission of text characters" (nr. 540849, see the patents table below) represents the birth of the "Bildschreiber" (i.e., "image writer"). It was later named "Hell-Schreiber", after its inventor. This has turned out to be one of the turning points in telecommunication. The basic idea of decomposing graphical information into pixels and lines that are easy to process (generate, transmit, reconstitute) has been the theme of Hell's life work. He developed the Hellschreiber in 1929, and that same year he licensed the rights to the Siemens-Halske (S-H) company for 13,000 Reichsmark - about half a million US dollars (2008). 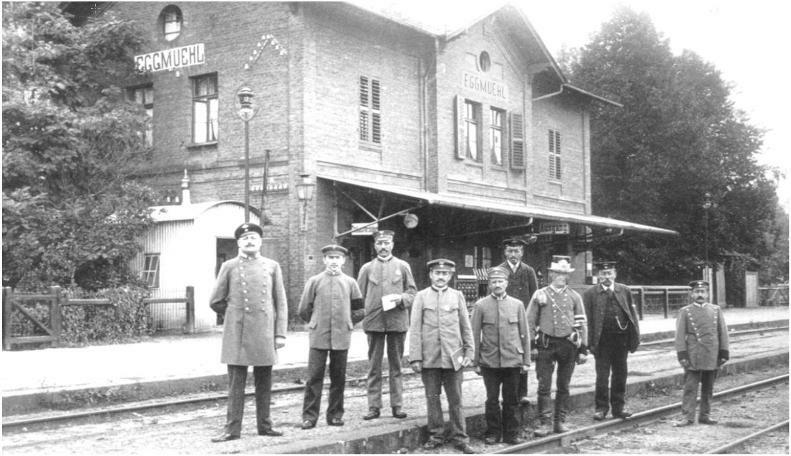 His first customer was the German national railway company. The house in Berlin-Dahlem was paid for with this money, plus the proceeds of the sale of his car, and a 3000 Mark inheritance from his mother. Ref. 49. In 1931 the company moved to larger facilities in Berlin-Dahlem, and again in 1937 - to facilities in Berlin-Zehlendorf, at Kronprinzenallee 138 (renamed to Clayallee in 1949). The latter was only a couple of streets away from Hell's house in the Ihnestraße. In 1941, production facilities for the war effort were added in Berlin-Teltow, in the Warthestraße, at an industrial site near the Teltow-canal. Here, Hellschreibers were manufactured, as well as equipment for the Kriegsmarine, radio compasses, radio direction-finding and crypto equipment. The Teltow facilities were dismantled by the Soviet occupational forces in 1946-1946 [ref. 81]. During the latter half of the 1930s, the Hell company had the radio callsign D2bw. This was an experimental license. Transmitter location, maximum output power, frequency bands (incl. amateur radio bands), modulation (telegraphy/phone) and purpose were fixed. Communication with other licensees was typically not allowed. The license of 1938 indicates the permission to use Hellschreiber telegraphy with 100 watt, for the development of telemetry systems and radio communication systems, per instructions of the Wehrmacht and other government organizations. Rudolf Hell as a private person did not hold a license. He does not appear on the 1936, 1937, or 1939 list of "Liebhaberfunker" (lit. "radio amateurs"), nor on the 1944 (short) list of "Kriegsfunkgenehmigungsinhaber" (war-time licensees). Ref. 61a/b/c. In 1926, he did co-author a hefty book about amateur radio antennas [ref. 63]. In Germany, the first broadcast radio station started transmissions in October of 1923 (Berlin). The only radios allowed, were those with a registration-stamp of the Reichstelegraphen-Verwaltung (Imperial Telegraphy Administration), part of the Deutsche Reichspost. Starting mid-May of 1924, private individuals could obtain a permit for owning and operating a receiver station ("Audion-Versuchserlaubnis"). This required passing of a knowledge test, administered by a radio club. From November of 1924 on, transmitter licenses were issued to radio clubs, corporate development labs, and technical universities - not to private individuals. Late August 1925, the Reichspost lifted the ban on the private construction of radio receivers. Amateur transmission were relegated to "pirate" transmissions with fictitious callsigns. The Fernmeldeanlagegesetz (Telecom Equipment Law) of 1928 made operation of all telephone, telegraph, teleprinter, and radio equipment subject to a (paid) registration license. The callsign prefix "D" became effective in Germany on 1 January 1929. Decrees of the Reichspost Ministerium in 1930 and 1931 made it illegal to hook up an antenna to a transmitter. The national-socialist regime came to power early 1933 and initially tried to dissolve the national amateur radio organization (DASD). In 1937, illegal transmissions became an offense, punishable with a prison sentence. Shortly after the beginning of WW2 in 1939, amateur radio was generally banned. However, a "Kriegsfunkgenehmigung" (war-time license) was issued to a small number of members of the Wehrmacht (e.g., about 150 in 1944, ref. 61c). Log books had to be sent to the DASD (controlled by Mr. Goebbels' ministry) on a regular basis. [ref. 63 and 64]. During the 1930s through 1945, the S-H company built large numbers (an estimated 50 thousand) of "Presse Hell" machines (for news agencies, etc.). According to Dr. Hell himself [ref. 6], the invention was an "Aha-Erlebnis" (a.k.a. "eureka moment"; the Greek εύρηκα roughly translates to "I have found it"), rather than the result of tedious research and development. Hell continued the development of Hellschreibers. Hell, like the entire industrial complex, was obliged to support the war effort. This included the development of Morse telegraphy (training) devices, metal detectors [ref. 74], fuses for mines, radio direction finders, and formation-flying flight-guidance systems. As a subcontractor to the C. Lorenz company, Hell developed and manufactured the UKE-5 and UKE-7 modules of the remote control & guidance receivers of the V2-missile [ref. 37]. 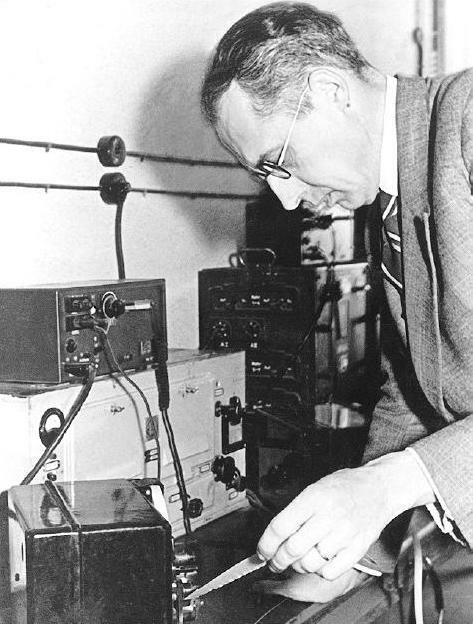 He co-developed the first missile-borne data recorder, based on video-camera technology [ref. 82]. He was also involved with the development of crypto machines (e.g., patent 855876). At the end of the war, he had about 1000 employees at his two factories. All was lost by the end of the war, and he started all over again in 1947 [ref. 57]. He re-established his company for telecommunications and electronic image reproduction equipment in Kiel (port city in the far north of Germany). Late 1947, Siemens-Halske decided to abandon the telefax/telecopy business. During the spring of 1948, the Hell Co. acquired the rights, all documentation, and the entire parts stock for the sum of 70 thousand Reichsmark. Ref. 7. In the photo above, the right-hand detail shows the printer mechanism that rests on the paper during the printing process (during scanning, it is parked in an upright position). Item a is toothed rubber wheel that rests on the paper and turns with it. The speed of this wheel is up-geared and drives a small rubber belt (item c). This belt continuously transfers ink from the narrow felt ink-roller (item b) to the tiny sapphire print wheel (item d). This print wheel is mounted in a small arm, and is pushed down onto the paper in the rhythm of the fax signal that is received from a scanning KF-108. In the 1950s, Hell developed several mechanical crypto machines for the German Bundeswehr, using technology licensed from the Swiss-based Hagelin Crypto AG company (founded by crypto pioneer Boris Hagelin). An example of this is shown below: the Hell H-54. This is a very compact (ca. 15x20cm) 6-wheel machine with a double printer (type-wheel, not Hell-spindle). This model was used until the late 1960s. In 1959, the Hell company opened an offfice in Great Neck, Long Island, NY, for marketing, sales, and customer support: the Hell Color Metal Corporation (HCM). Around 1990, when Dr.-Ing. Rudolf Hell GmbH merged with Linotype AG, the HCM company name appears to have changed to Hell Graphic Systems, with local offices in Melville/NY, Nashville/TN, and Tampa/FL and elsewhere. The Heidelberger Druckmaschinen AG acquired Linotype-Hell AG in 1995. Hell also revolutionized pre-press processing for printed media (newspapers, magazines, etc.) by developing the fast and precise Klischograph. This provided one-step operation of image scan/transfer and engraving of printing blocks and plates (later expanded for color images). The color Klischograph (ref. 83) reduced the time required to generate a single set of A4-size plates from one week, to four sets in one day! In 1963, he invented the Chromagraph color scanner that provided 4-color separation [ref. 50]. The famous HallmarkCards company ran type DC-300 Chromagraph scanners around the clock (3 shifts) for many years (1970 - mid-1980s, ref. 80). Hell also revolutionized film scanning (exposure) technology, and in 1964 developed the world's first electronic type setting machine with digitized fonts: the Digiset (marketed in the USA by the Graphic Services Dept. of RCA as the "VideoComp" CRT typesetter). It had a digital magnetic core "font" memory (originally 24 kB in size) and CRT-projection onto film. In 1968, the "DS" (Datensichtgerät) was the first computer (Siemens, of course) with a keyboard, CRT monitor, and text editing software. Corporate management, in its usual "wisdom", declared this a dead-end technology and it was subsequently abandoned. The "DS" remained unsurpassed for 15 years, until IBM popularized a similar product in 1983: the PC. The Dr.-Ing. Rudolf Hell & Co. KG (KG = Kommanditgesellschaft) company was converted into Dr.-Ing. Rudolf Hell GmbH in 1971, when Siemens AG increased its 49% minority share in the company to an 80% majority share. The company became a wholly-owned subsidiary of Siemens AG on January 31, 1981 (ref. 84). In 1978, Dr. Hell was awarded the prestigious Werner-von-Siemens-Ring for achievements in science and technology (ref. 49). He retired from active business activities in 1990. Fig. 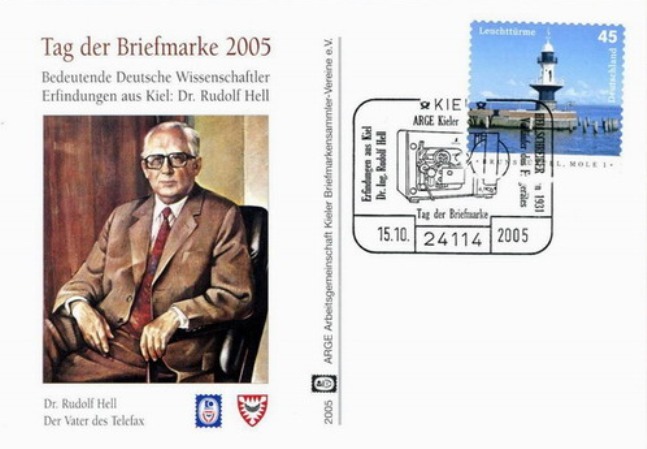 19: Commemorative post card from the 2005 German "National Stamp Day"
The table below lists a selection of patents that list Rudolf Hell as the inventor, and are related to various aspects of Hellschreibers. Worldwide, he is listed as (co-)inventor on nearly 1000 patents. Patents most closely related to the basic principles of Hellschreibers have been highlighted with bold face font. Scanned copies of the original patents are available by clicking on the respective patent number. The table lists the publication date of the patent award. Application for the patent may have been filed several (sometimes many) years prior to the actual award. Also, the date from which the patent rights apply may be different from the filing and the publication date. See the actual patents for details. 9699210 BD 1949 Dr.-Ing. Rudolf Hell Fa. Dr.-Ing. Rudolf Hell Vorrichtung zum Aussenden von in Bildelemente zerlegten Schriftzeichen nach dem Hell-System mittels Impulsfolgen Device for the transmission with pulse sequences of characters that have been decomposed into pixels per the Hell-system. PATFT, the on-line public database of the United States Patent and Trademark Office. Interesting development and patent activities in this same area are by Ernst Eduard Kleinschmidt, a German-born US immigrant. During the period 1915-1920 he developed electromechanical printing telegraphs with Charles Krum. 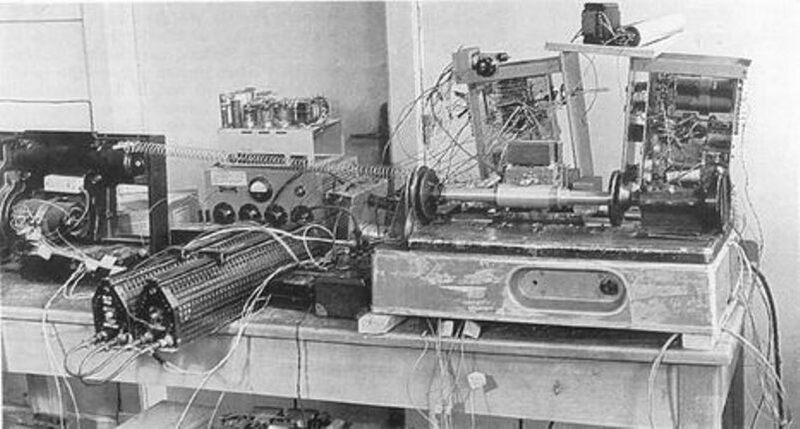 Their improved synchronization method was used in the "Springschreiber" ("start-stop teleprinter"). It was licensed to the C. Lorenz company of Berlin-Tempelhof in 1926, and equipment was sold directly to the Deutsche Reichspost that same year. Siemens-Halske developed similar machines that avoided that Kleinschmidt patent (e.g., Blattschreiber "T typ 37"), as did the Creed Co. in the UK. The Kleinschmidt patent listed below was filed August 1930, well after Hell's original patent filed April 1929. It also includes a double-helix printer spindle and a (notched) character code drum, though the construction is more complex. Kleinschmidt is behind the development of Teletype Corp. Model 17 teleprinter, which appears functionally to be a copy of the Hell Feldfernschreiber. The C. Lorenz company also obtained patents regarding the decomposition of text characters into pixels. The three patents listed below are basically identical, but filed and obtained in different countries. Towards the end of WWII, the Allies began a massive, systematic search for and capture of German “war secrets” technology, scientific knowledge and industrial know-how. Upon the German surrender, as part of war reparations, this was expanded with confiscation of all existing (and new) German intellectual property, and of all associated rights (e.g., patents) in Germany and abroad. Companies in Allied countries, and others considering themselves as such, were given access to much of the records and material, as well as to factories and research institutes in occupied Germany, either for free or for a symbolic fee. In many cases, they found technology that was years or decades ahead of “Allied” technology. This official grab lasted for at least two years. Ref. 34, 35. Ref. 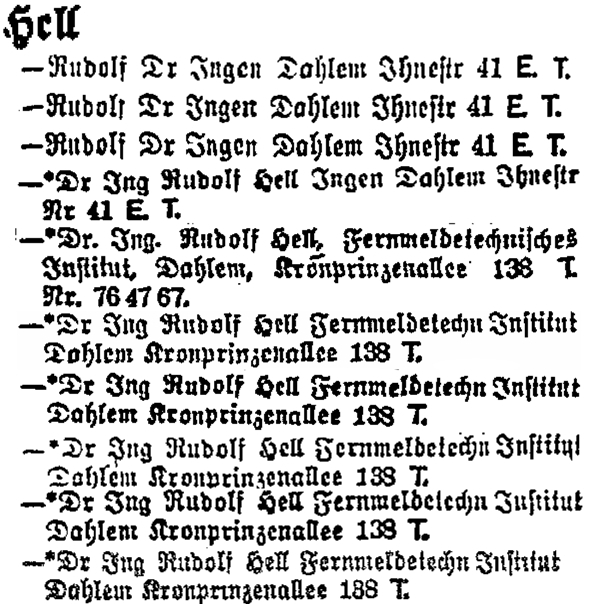 1: "Die Entwicklung des Hell-Schreibers" by the inventor himself: Rudolf Hell; pp. 2-11 in "Hell - Technische Mitteilungen der Firma Dr.-Ing. Rudolf Hell - Gerätentwicklungen aus den Jahren 1929-1939", Nr. 1, May 1940. Ref. 2: p. 388-389 in "Decrypted Secrets: Methods and Maxims of Cryptology", by F. L. Bauer, Springer Verlag, 2002, 473 pp. Ref. 3: p. 23 in "Some historical and technical aspects of radio navigation, in Germany, over the period 1907 to 1945", by A.O. Bauer, PAØAOB, 28 pp. Ref. 4: p. 13, 18 in "Blitz! : Germany's Arado Ar 234 Jet Bomber", by J.R. Smith, E.J. Creek, Merriam Press, 1997. Ref. 5: "Hitlers letzte Maschinen" chapter 2.17 in "Codeknacker gegen Codemacher - Die faszinierende Geschichte der Verschlüsselung", by K. Schmeh, W3L Verlag, 2nd edition, 2007, 414 pp. Ref. 6: "Der SH-Feldschreiber", Siemens-Halske AG, Berlin-Siemensstadt, SH 7535. 1.2.39. TT1., 11 pp. (courtesy Siemens Corporate Archives, München). Ref. 7: "Dr.-Ing. Rudolf Hell: Der Jahrhundert-Ingenieur im Spiegelbild des Zeitgeschehens. Sein beispielhaftes Wirken" ["Dr.-Ing. Rudolf Hell: engineer of the century. His exemplary contributions"], Boris Fuchs and Christian Onnasch, Edition Braus, Wachter Verlag, 2005, ISBN 3-89904-163-1, 280 pp. Ref. 8: "My collaboration with Don Knuth and my font design work", Hermann Zapf, TUGboat (Communications of the TeX Users Group), Vol. 0, 2000, No. 0, pp. 26-30. Ref. 9: "Oral-History: Nobutoshi Kihara" (interview with Sony engineer), IEEE Global History Network, People and Organizations, January 2009. Ref. 10: "Siemens A.G. Business Information, Profile, and History", Company Profiles Vol. 76. Ref. 11: "Historical German contributions to physics and applications of electromagnetic oscillations and waves", by Manfred Thumm, Chapter 11 in "History of Wireless", Wiley-IEEE Press, 2006. Ref. 12: "Siemens und die Siemensstadt - Ein Standort im Wandel der Zeit", Siemens AG, Berlin 1999. Ref. 13: "Siemens: Wiederaufbau in Berlin-Siemensstadt, Investierungen 1945 -1952", Büxenstein, 1952, 56 pp. Ref. 14: "Die Siemensstadt: Geschichte und Architektur eines Industriestandortes", Wolfgang Ribbe and Wolfgang Schäche, Ernst & Sohn, 1985, 876 pp., ISBN 3433010234. Ref. 15: "160 years of Siemens", Wilfried Feldenkirchen, special edition of SiemensWorld, October 2007, 4 pp. Ref. 17: "Radiokatalog Band 1", by Ernst Erb, M+K Computer Verlag AG, 1st ed.,1998, 400 pp, ISBN-10: 3907007212. Ref. 18: "Rundfunkindustrie in Dresden - Radio Mende und Funkwerk Dresden", Waldemar Ueberfuhr, March 2007, 3 pp. ; Appendix 5.1.1 to "VEB Robotron-Meßelektronik "Otto Schön" Dresden". Ref. 19: "Wegbereiter der Nachrichtentechnik", G. Weinreich, Deutsche Telekom Unterrichtsblätter, Jg. 53, Nr. 1, January 2000, pp. 32-36. Ref. 20: "Die Entwicklung des Bildfunks", Funk (Wochenschrift des Funkwesens), Weidmannsche Buchh., 1926, Heft 17, p. 131. Ref. 21: "Rudolf Hell war ein genialer Erfinder", Gottfried North, in "DAS ARCHIV - Magazin für Kommunikationsgeschichte, Deutsche Gesellschaft für Post- und Telekommunikationsgeschichte e.V. ", 2003, Band 2, pp. 96 – 97. Ref. 22: "Rudolf Hell zum 100. Geburtstag - Das Jahrhundert entscheidend mitgeprägt", Festschrift der Heidelberger Druck AG zum 100. Geburtstag von Dr. Rudolf Hell, 21 December 2001, 16 pp. Ref. 23: "Lebensdaten und Ehrungen Dr. Rudolf Hell", Archiv Schierling 2001. Ref. 24: "Laudatio auf Dr.-Ing., Dr.-Ing. E.h. Rudolf Hell zum 100. Geburtstag", Boris Fuchs, Frankenthal, Archiv Schierling 2001. Ref. 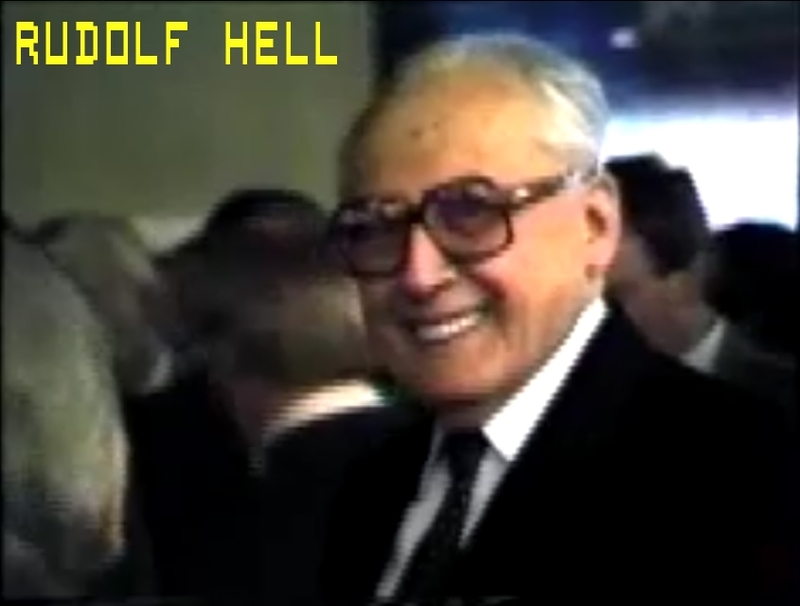 25: "Hell-Schreiben - Dr. Hell wird 85 Jahre alt", Thomas Beiderwieden (DG9YAG), cq-DL, 1989, nr. 2, p. 120. Ref. 26: "Hell-FAX", Jörg Schlemminger (DB4LM), cq-DL, 1987, nr. 3, p. 182. Ref. 27: "Gutenberg-Preis der Stadt Mainz und der Gutenberg-Gesellschaft verliehen an Rudolf Hell am 25. Juni 1977", Reihe: Kleiner Druck der Gutenberg-Gesellschaft, Nr. 104, Gutenberg-Gesellschaft, 1978, 32 pp., ISBN-10: 3775521046 (here: only pp. 14-32: speeches by Prof. H. Zapf and Rudolf Hell) (in German). Ref. 28: "Transmission and reception of Photoradiograms" [fax technology and history], R. H. Ranger, Proceedings of the Institute of Radio Engineers (IRE), Vol. 14, No. 2, April 1926, pp. 161-180. Ref. 29: "Der Betrieb von Siemens-Hell-Schreibern auf Hochspannungsleitungen im Elektrizitätswerk-Nachrichtendienst" [operating Hellschreibers over 60 kV and 100 kV power lines], Fernmeldetechnik, Siemens & Halske, Berlin-Siemensstadt, 1939, SH. 7802, 1,5 9. 39, 4 pp. Ref. 31: "Enigma", [incl. PA0AOB Hellschreiber] D.W. Rollema (PA0SE), Wireless World, Vol. 89, Nr. 1569, June 1983, p. 49-54. Ref. 32: "The Tiltman Break", F.L. Bauer, Appendix 5, pp. 370, 371 in "Colossus: the secrets of Bletchley Park's codebraking computers", B. Jack Copeland (ed. ), Oxford University Press, 2006, ISBN 019284055X, 462 pp. Ref. 33: "Die Fernmeldetechnik als Hilfe bei der Rationalisierung der Eisenbahn", W. Leitenberger [Hellschreiber use in German railroad system is described in Section 3: "Modernisierung des Eisenbahnbetriebes"], ETR: Eisenbahntechnische Rundschau, Nr. 4, April 1966, pp. 139-146. Ref. 34: "Science Technology and Reparations: Exploitation and Plunder in Postwar Germany", John Gimbel, Stanford University Press, 1990, 280 pp., ISBN/ISSN: 0804717613. Ref. 35: "Secrets By The Thousands", C. Lester Walker, Harper's Magazine, October 1946, pp. 329-336. Ref. 36: "A.E.G. avoids the bombs in WW II", in Chapter 3 of "Wall Street and the Rise of Adolf Hitler", Antony C. Sutton, Buccaneer Books, 1999, 224 pp, ISBN: 1568497261. Ref. 37: p. 121 and p. 127 in "Die deutschen Funklenkverfahren bis 1945", Fritz Trenkle, AEG-Telefunken AG, 1982, 216 pp., ISBN 3870871334. Ref. 38: "Ein Firmenbild wird zerlegt - Eine Visitenkarte der Dr.-Ing. Rudolf Hell GmbH - Scanning of an image". Ref. 39: "p. 4 in "Im Prinzip ganz einfach - Bild und Schrift mit Hell-Technik". Ref. 40: "Catholic school shuns pupil called Hell", The Times, 10 July 2007. Ref. 41: "The Siemens Company; its historical role in the progress of electrical engineering with chronological table 1847-1977", S. von Weiher, H. Goetzeler, Siemens, 1977, 183 pp. Ref. 42: "Die Siemensstadt; Geschichte und Architektur eines Industriestandortes", Wolfgang Ribbe, Wolfgang Schäche, Ernst Verlag, 1985, 876 pp., ISBN 3-433-01023-4. Ref. 43: "Max Dieckmann: Gründer des Forschungs-Standortes Oberpfaffenhofen Überblick über seine wissenschaftlichen Aktivitäten", Rudolf Schmid, 06 Nov. 2007, 13 pp. presentation. Ref. 44A: "Verfahren zur Übertragung von Schriftzeichen und Strichzeichnungen unter Benutzung der Kathodenstrahlröhre" [Method for the transmission of letters and line drawings, using a cathode-ray tube], Max Dieckmann, Gustav Glage, Kaiserliches Patentamt Patentschrift Nr. 190102, filed 12 September 1906, awarded 9 September 1907. Demonstrated in 1907 with a 3x3 cm image, 20 image lines, 10 Hz image update rate! Ref. 44B: "Anordnung zur Abtastung von Schriftzeichen für Bilduebertragungszwecke mittels engbenachbarter leitender Stifte" [Arrangement for scanning characters by means of closely space styli, for the purpose of image transmission], Reichspatentamt Patentschrift Nr. 520466, Dr. Max Dieckmann, filed 24 March 1929. Ref. 44C: "Walzensteuerung fürr elektrische Kopiertelegraphenempfaenger mit Gleichtrittregelung und Aufzeichnung der Schriftzeichen in einer Wendellinie auf die mit Papier bespannte Walze mittels einer Schreibspitze" [Control with synchonization, of a drum for electrical telecopying receivers, and spiral recording of characters onto a paper-covered drum, using a printing tip], Reichspatentamt Patentschrift Nr. 461947, Dr. Max Dieckmann, filed 9 Juni 1926. Ref. 45: "A narrative bibliography of radio facsimile", Callahan, J.L., pp. 112-128 in "Radio facsimile - Volume 1", Goldsmith, A.N., Van Dyck, A.F., Horn, C.W., Morris, R.M., Galvin, L. (eds. ), RCA Institutes Technical Press, 1938, 353 pp. Ref. 46: "Aus der Geschichte des Hauses Siemens - 40 Jahre S&H-Zeichen", Siemens-Zeitschrift, Band 18, Heft 10/11, October/November 1938, p. 497. Ref. 49: "Werner-von Siemens-Ring-Verleihung 1978, Rudolf Hell", Stiftung Werner-von-Siemens-Ring, Berlin, 1980. Ref. 50: "Technik für uns alle" part 1-7, Wolf Rustmeier, Hell company magazine, March 1981 - May 1982. Ref. 51: "Gestorben - Rudolf Hell, 100", obituary in "Der Spiegel", Nr. 12, 2002, 18 March 2002, p. 246. Ref. 52: "Lorenz and Colossus" [military cryptography], A.E. Sale, Proc. of the 13th IEEE Computer Security Foundations Workshop, (CSFW-13), 2000, pp. 216-222. Ref. 53B: pp. 94-96, 162, 163, 170-172 in the 2nd ed., Heinrich-Karl Podszeck, Springer Verlag, 1952, 183 pp. Ref. 54: "Neue Stufe der Nachrichtenübermittlung. Der Hellschreiber wird den Sprechfunk ersetzen", p. 261, 262 in "Der Zeitungs-Verlag: Fachblatt für das gesamte Pressewesen", Vol. 40, Nr. 17, 29 April 1939. Ref. 55: "The awful German language", Appendix D of "A Tramp Abroad" by Mark Twain, 1880. Ref. 56: "Rudolf Hell 65 years old", in "NTZ-Communications journal" (NTZ-CJ), No. 3, 1967, p. 146. Ref. 58: "Siemens liefert größte Lichtsetzanlage and das Berliner Satz-Rechen-Zentrum Hartmann + Heenemenna KG", in "Neues aus Forschung, Industrie und Wirtschaft", in "Frequenz - Zeitschrift für Schwingungs- und Schwachstromtechnik", Bd. 26, Nr. 1, January 1972, p. 28. Ref. 59: p. 387 in "Faksimiletechnik", §10 (pp. 381-392) of "Fernschreibtechnik", Fritz Schiweck, Band 9 of "Lehrbücher der Feinwerktechnik", 4th ed., 1962, C. F. Winter, 894 pp. Ref. 60: "Hell, Rudolf", Herbert Goetzeler, pp. 76-77 in "Männer der Funktechnik – eine Sammlung von 70 Lebenswerken deutscher Pioniere der Funktechnik (drahtlose Telegrafie, Radar, Rundfunk und Fernsehen)", Sigfrid von Weiher (ed. ), VDE-Verlag,1983, ISBN 3-8007-1314-4. Ref. 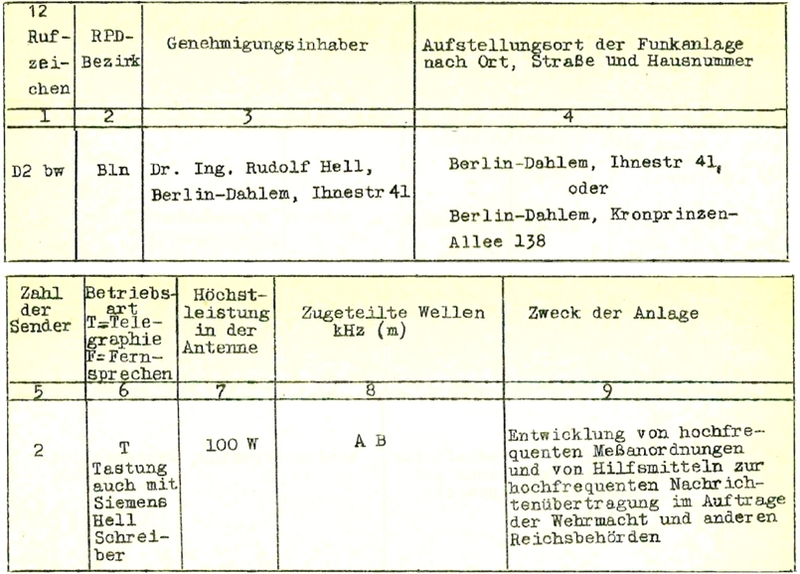 61A: p. 6 in "Rufzeichenliste der von der deutschen Reichspost genehmigten privaten Versuchsfunkanlagen mit Fernstrahlung (einschl. der versuchsanlagen der DRP)", Reichspostzentralamt, Belin-Tempelhof, 1 May 1935, 12 pp. Source: "Funk in Braunschweig - Die ersten Anfänge" page of the website of Radioclub Braunschweig - Dr.-Ing E. Viehl. Ref. 61B: p. 6 in "Rufzeichenliste", 1938, 22 pp. Same source as ref. 61a. Ref. 61C: "Liste der Kreigsfunkgenehmigungsinhaber (Stand 25. August 1944)"
Ref. 62: "Antenne und Erde", Hanns Günther and Rudolf Hell, 1926; reprinted in 1994 by Wilhelm Herbst Verlag, 336 pages, ISBN 3-923-925-54-9. Ref. 63: "Geschichte des Amateurfunk und die rechtlichen Grundlagen" on the website of the DARC. Ref. 65: "Rudolf Hell 1901 bis 2002", p. 34 in "Glückwunsch, Dipl.-Ing.! Ein Gutesiegel made in Germany wird 111 Jahre alt", Ernst M. Schmachtenberger (ed. ), TU9 Die Allianz der führenden Technischen Universitäten in Deutschland, 2010, 82 pp., ISBN 978-3-00-032050-7. Ref. 66: "Umbruch in der Medienwelt: der Erfinder Rudolf Hell Der Erfinder Rudolf Hell", F. Gnegel, in "Das Archiv. Magazin für Post- und Telekommunikationsgeschichte", 2009, Heft 2, pp. 65-70. See note 1. Ref. 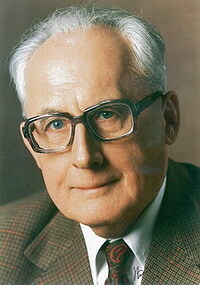 67: "Rudolf Hell 75 Jahre", pp. 1-4 in "für uns alle - Werkzeitschrift der Dr.-Ing. Rudolf Hell GmbH", Nr. 39, 10 January 1977. Ref. 68: "Dr. Hell zum 80. Geburtstag", pp. 1-5 in "für uns alle - Werkzeitschrift der Dr.-Ing. Rudolf Hell GmbH", Nr. 70, 19 December 1981. Ref. 69: p. 197-199 in "Blitz & Anker: Informationstechnik - Geschichte und Hintergründe, Volume 1", Joachim Beckh, BoD GmbH, 2005, 560 pp. Ref. 70: p. 1 in "Signal + Draht: Zeitschrift für das Signal- und Fernmeldewesen der Eisenbahnen", Nr. 11/12, November 1968. Ref. 71A: "Faksimileschreiber Siemens-Hell-Fax KF 108 - Beschreibung und Bedienungsanleitung", Fs Bs und Ba 1253/8, Siemens Fernschreibtechnik, Siemens & Halske A.G., Wernerwerk für Telegrafen- und Signaltechnik, November 1960, 63 pp. Ref. 72: "Exportweltmeister für Ideen - In Deutschland erfunden, in Japan gebaut" [World champion in export of ideas - invented in Germany, built in Japan], Klaus-Peter Kerbusk, SPIEGEL SPECIAL "Made in Germany - Wie die deutsche Wirtschaft durch die Globalisierung gewinnt", Nr.5/2008, 158 pp; Spiegel Online 18-Nov-2009. Ref. 73: "50 Jahre Polizeifunk - Geschichte des Funkwesens der Sicherheitsbehörden", Alfred Samlowski (ed. ), Polizei Technik Verkehr (publ. ), 1970, 100 pp. Ref. 74: "Der DVL-Hell-Eisensucher", K. Bär, pp. 50-52 in "Hell - Technische Mitteilungen der Firma Dr.-Ing. Rudolf Hell - Gerätentwicklungen aus den Jahren 1929-1939", Nr. 1, May 1940. Ref. 75: p. 337 in "Blitz & Anker: Informationstechnik - Geschichte und Hintergründe, Volume 1", Joachim Beckh, BoD GmbH, 2005, 560 pp. Ref. 76: "Faksimileschreiber Siemens-Hell-Fax KF 108 - Beschreibung und Bedienungsanleitung", Siemens Fernschreibtechnik, Fs Bs und Ba 1233/B, Siemens & Halske AG, Wernerwerk für Telegrafen- und Signaltechnik, November 1960, 63 pp. Ref. 77: "Anleitung zum Selbstbau eines Bildempfängers", Bildfunk 1927, Die Radio-Reihe, Band 21, VIII, R.C. Schmidt Verlag, 114 pp. Ref. 78: "Die Selbstherstellung eines Funkbild-Empfangsgerätes" [build your own fax receiver-printer], Rudolf Hell, in "Funk", Wochenschrift des Funkwesens, Weidmannsche Buchhandlung, 1926, 6 pp. Ref. 79: "Direktzeigendes funkentelegraphisches Peilverfahren", 1929, 10 pp., Krayn Verlag, Berlin, Hochschulschrift, 1928 doctoral dissertation at Technische Hochschule München; also appeared in: "Jahrbuch der drahtlosen Telegraphie". Ref. 80: Personal correspondence with J. Vingard, December 2014. Ref. 81: p. 421 in "Demontagen in der Sowjetischen Besatzungszone und in Berlin 1945 bis 1948 - Sachthematisches Inventar", Klaus Neitmann (ed. ), Jochen Laufer (ed. ), Klaus Jochen Arnold, Brandenburgisches Landeshauptarchiv, Zentrum für Zeithistorische Forschung, Potsdam 2007, 467 pp. Ref. 82: p. 282 in "Early Developments in Rocket and Spacecraft Performance, Guidance, and Instrumentation"", Ernst A. Steinhoff, in "Smithsonian Annals of Flight", Nr. 10, "First Steps Towards Space", Frederick Durant, George James (eds. ), Smithsonian Institution Press, 1974, 307 pp. Ref. 83: "Express-News Scores 'First' With Electronic Color Plates" [first color Klischograph in US], San Antonio Express and News (newspaper), 10 June 1961, p. 15. Ref. 84: "100 Prozent Siemens", p. 2 in "für uns alle - Werkzeitschrift der Dr.Ing. Rudolf Hell GmbH", Nr. 63, 17 March 1981. Source: Hell Verein Kiel. Ref. 85: p. 20 in "Ein Firmenbild wird zerlegt - Scanning of an image" [pdf], p. 2 in "für uns alle - Werkzeitschrift der Dr.Ing. Rudolf Hell GmbH", Nr. 63, 17 March 1981. Source: Hell Verein Kiel.